Wrap It Up | Home Style | Style Weekly - Richmond, VA local news, arts, and events. Beauty is often said to come from within. When it comes to gifts, however, there's no reason the internal and the external elements can't be equally appealing to the eye. If you have the time, the interest and the resources, holiday gifts can amount to works of art -- and that's before the unwrapping begins. This year, sidestep ho-hum packaging for something with a little more oomph by following the advice of some of Richmond's unofficial gift-wrapping gurus. No need to search the hall closet for those evasive holiday gift tags when your festive greetings can be inscribed right on the gift wrap. Notesetc.net, a Richmond-based online stationery boutique, carries personalized gift wrap, ribbon and gift bags by Namemaker, a company that made Oprah's list of favorite things. But make haste: This late in the game, custom orders are available only by rush and only for a few more days. If you're feeling creative (and budget-minded), forgo the commercial wrap and hit the craft store, where you can dig up holiday stamps to personalize simple brown craft paper for an old-fashioned take on the trend. Don't be afraid to step outside the traditional lines of holiday wrapping by embracing earthy browns, cool winter blues and other off-the-beaten-track hues. "We see so much of the red and green," said Douglas D'Urso, manager of Mongrel gift store in Carytown. "It's nice to see something different." D'Urso's gift-wrapping crew isn't afraid to step entirely off the holiday map with themed gifts, like the Italian map-wrapped box, complete with a tiny Tower of Pisa  perfect for the avid traveler. Likewise, a dog lover would revel in a doggie paper-wrapped gift adorned with a Christmas squeaky-toy set  providing something for the recipient and his four-legged best friend. pink for the recipient, opt for a single statement-making piece, like the supersized ornament that she uses as an eye-catching gift tag. If your eco conscience cringes at the thought of all that gift wrap and ribbon, take the green route and reuse, repurpose and recycle. For eco-friendly  and economical  gift packaging, seek materials from around the house. Valerie Sanson, who employs eco-friendly practices at Lane Sanson, her Carytown home accessories store, suggests wrapping gifts in newspaper sections that are tailored to the recipient: comics for the class clown, stock listings for the business-minded and recipes for the chef extraordinaire. Backyard foliage adds a natural element to your packaging, while brightly colored shopping bags and glossy magazines can be cut up to create fanciful bows and adornments. Sanson secured a bow tie fashioned from a Harry & David catalog around an empty wine bottle to make a fitting vessel for homemade liqueurs, but the options are endless  just keep your creative wheels spinning. If you struggle between a yearning to be green and a need for traditional holiday wrap, satisfy both desires with recycled papers and cards. Fish Lips makes 100 percent post-consumer recycled wrapping papers in an array of fashion-forward designs, while Earth Love'N Paper produces more traditional styles bearing the likes of Rudolph and festive stockings. Find both lines at Alchemy, Carytown's newest eco-chic boutique. 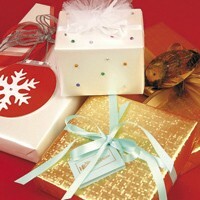 Turn the conventional idea of gift wrap on its head by making the packaging part of the present. A charming kitchen towel or bath linen is a chic way to conceal the real present while providing a handy household or fashion accessory. Also consider wrapping with vintage scarves, tablecloths or canvas totes that can be used for grocery shopping or errand running.